October | 2013 | From Student to Teacher. 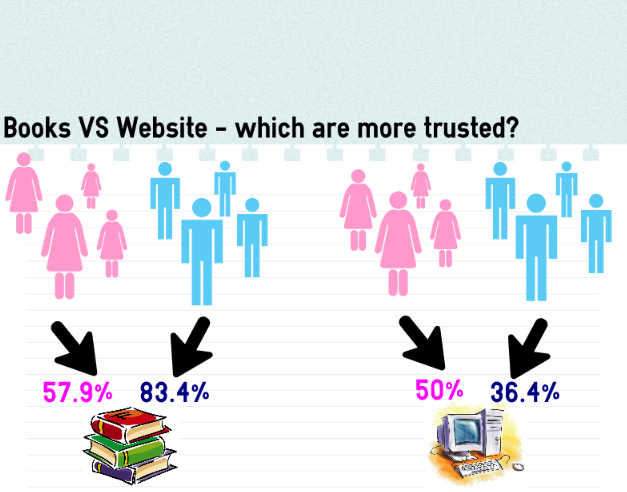 Books vs Website – Which are more trusted? During our induction week, and as part of our Digital Literacy specialism day, we went to Plymouth School of Creative Arts, and carried out a survey about children’s familiarity and understanding of technology and how it works. We asked children, in the range of 4 – 6 years old a variety of different questions, such as how they use the internet at home and what parts of technology they are familiar with. There was a question, which asked children, ‘How much do you trust ideas or information from the following?’ television, websites, books, newspapers, family, teachers, strangers etc. This, therefore, gave the children the chance to think about a variety of different things which weren’t all related to technology directly. The children were allowed to respond in 5 different ways: ‘trust a lot’, ‘trust a bit’, ‘not sure’, ‘don’t trust’ and ‘might be dangerous’. I decided to take a closer look at the difference in children trusting books in comparison to websites and see if gender had an influence on my findings. The results can suggest many different things. The first, being that children still understand the importance of books and that the information they get from them is reliable and trusted. However, the information they get from the internet isn’t always so accurate, and such websites, as Wikipedia, allow anybody to enter information which is not necessarily true or accurate. The answers which the child gave could also depend on their home life, as the children are new to school and some may not have been given the opportunity to use technology at home and therefore don’t fully understand the purpose of it. “The level and type of support that learners receive from other individuals will be determined by the knowledge, skills and attitudes of those individuals. For example, parents’ skills and attitudes will influence learners’ use of technology at home. Those with limited technology skills and knowledge may feel unsure or unable to provide support.” Whereas, most children would have used many books in the past and therefore it is something they are familiar with and feel comfortable using. Looking more closely at gender, there is a strong correlation in relation to the boys being more decisive about trusting, or not trusting, these particular resources, where as girls are very much undecided. This could suggest that the boys hold stronger, and similar opinions, on the matter. There are many limitations to this survey as it was only given to a small proportion of students and that the survey was quite lengthy, meaning that the children began to lack interest towards the end. It could also mean that the children were saying anything in order to be able to get back to their classroom activity. Another issue, that also needs to be addressed is that because the children are of a young age and the questions were sometimes worded too complicatedly for them to understand, they may not have had a full semantic awareness and therefore, have chosen an answer that they thought we’d be most happy with. Becoming a Primary School teacher appeals to me for many different reasons, firstly I enjoy the interaction with the children and playing an active role in their formation of ideas and knowledge. It additionally satisfies me greatly to see children learn and develop their own opinions and attitudes. I believe that I have a holistic understanding of a child’s needs and could provide education and support that reflects this. During my time in education, I have come across a variety of different teachers, all with different styles and approaches to learning. However, a few stand out to me more than others because of their enthusiasm to teach and you can genuinely see that they are passionate about making every child the most successful they can be, this therefore reflects in the class and has an overall positive, motivated vibe. Those are the teachers that I inspire to be as influential as. I originally came about the idea of becoming a Primary School teacher from a young age and when I did a week’s work experience in a Primary School during year 10 it confirmed it was something I enjoyed doing. This gave me an insight in to what happened in the classroom on a daily basis and gave me the opportunity to look at it from an external point of view, rather than being a pupil myself. Last academic year, I worked in a Primary School every Tuesday afternoon, the class consisted of both year 1 and 2 children. With that experience it allowed me to develop an understanding of what is expected from the teacher and to develop on several skills such as how to make sure that effective discipline is given and maintained, preparing and organising classroom resources so that they are used in a positive way in which the children will want to work with and motivating the children through enthusiasm. I believe that good communication and listening is the key to a good quality of teaching and this placement allowed me to build on this.